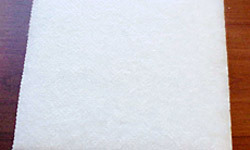 Ecolan/Recolan felts and panels are a family of sound and thermal insulation products made with a new technology, devoted to heat and sound insulation, in both residential and industrial areas; a sector that, with the emergence of new priorities in the field of environmental protection and energy savings, is becoming more and more important. Good thermal and sound insulation reduces noise pollution and prevents heat loss, accordingly decreasing energy consumption. A sound or thermal insulation system properly designed improves the quality of life. Ecolan/Recolan sound and thermal insulation felts and panels are fully recyclable products, thereby contributing to sustainable development. The benefits for people and the environment are related to the characteristics of the products used. Ecolan/Recolan sound and thermal insulators are all made with non-toxic raw materials and processes. Their use requires no warnings, they don't release any fibers or dust into the air and they are non-toxic and anallergic. The innovative production technology, arranging the fibers three-dimensionally, provides greater strength for the same thickness, also using smaller densities with cost benefits for the users. They can be made to order in combination with black fabrics or any other types of finish. They can be cut to size. The above data about Ecolan/Recolan sound and thermal insulation products are given in good faith and refer to values obtained from samples of current productions. We reserve the right to modify the technical characteristics or update the data without notice following developments in technology and/or our experience.